How old is the Naga political issue? The British annexed Assam in 1826, and in 1881, the Naga Hills too became part of British India. The first sign of Naga resistance was seen in the formation of the Naga Club in 1918, which told the Simon Commission in 1929 “to leave us alone to determine for ourselves as in ancient times”. In 1946 came the Naga National Council (NNC), which, under the leadership of Angami Zapu Phizo, declared Nagaland an independent state on August 14, 1947. The NNC resolved to establish a “sovereign Naga state” and conducted a “referendum” in 1951, in which “99 per cent” supported an “independent” Nagaland. When did the armed movement begin? On March 22, 1952, Phizo formed the underground Naga Federal Government (NFG) and the Naga Federal Army (NFA). The Government of India sent in the Army to crush the insurgency and, in 1958, enacted the Armed Forces (Special Powers) Act. When did the peace efforts start? Almost simultaneously with the resistance. On June 29, 1947, Assam Governor Sir Akbar Hyderi signed a 9-point agreement with moderates T Sakhrie and Aliba Imti, which was almost immediately rejected by Phizo. The Naga Hills, a district of Assam, was upgraded to a state in 1963, by also adding the Tuensang Tract that was then part of NEFA. In April the next year, Jai Prakash Narain, Assam Chief Minister Bimala Prasad Chaliha and Rev. Michael Scott formed a Peace Mission, and got the government and NNC to sign an agreement to suspend operations that September. But the NNC/NFG/NFA continued to indulge in violence, and after six rounds of talks, the Peace Mission was abandoned in 1967, and a massive counter-insurgency operation launched. When did the NSCN come into being? On November 11, 1975, the government got a section of NNC leaders to sign the Shillong Accord, under which this section of NNC and NFG agreed to give up arms. A group of about 140 members led by Thuingaleng Muivah, who were at that time in China, refused to accept the Shillong Accord, and formed the National Socialist Council of Nagaland in 1980. Muivah also had Isak Chisi Swu and S S Khaplang with him. 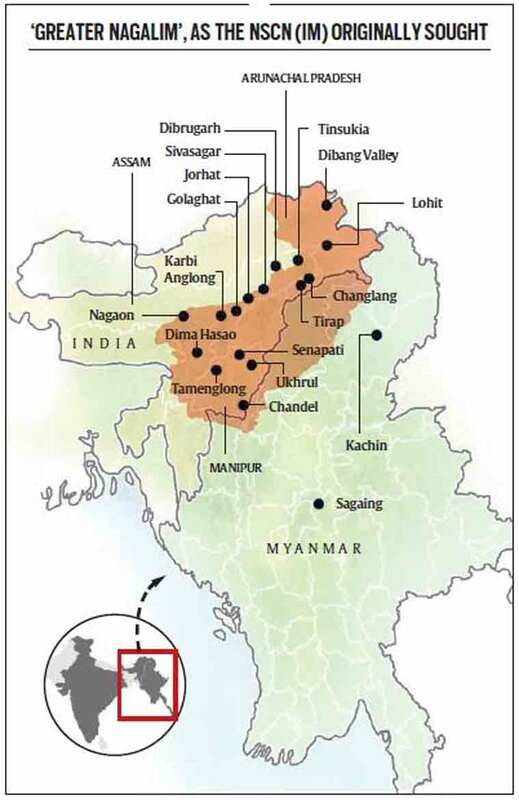 In 1988, the NSCN split into NSCN (IM) and NSCN (K) after a violent clash. While the NNC began to fade away, and Phizo died in London in 1991, the NSCN (IM) came to be seen as the “mother of all insurgencies” in the region. What did the NSCN (IM) want? A “Greater Nagalim” comprising “all contiguous Naga-inhabited areas”, along with Nagaland. That included several districts of Assam, Arunachal and Manipur, as also a large tract of Myanmar. The map of “Greater Nagalim” has about 1,20,000 sq km, while the state of Nagaland consists of 16,527 sq km. The claims have always kept Assam, Manipur and Arunachal Pradesh wary of a peace settlement that might affect their territories. The Nagaland Assembly has endorsed the ‘Greater Nagalim’ demand — “Integration of all Naga-inhabited contiguous areas under one administrative umbrella” — as many as five times: in December 1964, August 1970, September 1994, December 2003 and as recently as on July 27, 2015. When did NSCN (IM) join peace talks? Muivah, Swu and other top NSCN (IM) leaders escaped to Thailand in the early 1990s. While Nagaland Governor M M Thomas, a Church leader from Kerala, extracted the first positive response from the NSCN(IM), Prime Minister P V Narasimha Rao met Muivah, Swu and others in Paris on June 15, 1995. In November 1995, then MoS (Home) Rajesh Pilot met them in Bangkok. Subsequently, Prime Minister H D Deve Gowda met them in Zurich on February 3, 1997, which was followed by meetings with officers in Geneva and Bangkok. Prime Minister Atal Bihari Vajpayee met them in Paris on September 30, 1998. The Government of India signed a ceasefire agreement with NSCN (IM) on July 25, 1997, which came into effect on August 1, 1997. Over 80 rounds of talks between the two sides were held subsequently. How did Prime Minister Modi travel the last mile? For the NSCN (IM), the Modi government continues from where Vajpayee left. The RSS’s Northeast veteran P B Acharya is currently Nagaland Governor, and Joint Intelligence Committee chairman R N Ravi, with his IB background, is an old Northeast hand. The state’s political scenario has changed, with T R Zeliang’s Naga People’s Front, an NDA ally, persuading all groups in the Assembly, including the Congress, to become partners in an all-party government. How have Manipur, Assam and Arunachal Pradesh reacted? Leaders cutting across party lines have preferred to wait and watch. Nobody in these three states would allow even an inch of their land to be added to a ‘Greater Nagalim’, if at all that term is part of the accord. What about S S Khaplang? In March this year, he abrogated the ceasefire he had signed in 2001, and is sure to oppose the accord. Security forces have been already alerted across Nagaland, Assam, Manipur and Arunachal Pradesh. This was Atal Bihari Vajpayee, opening his speech at a public reception in Kohima on October 28, 2003. He went on to speak about the “unique history” of the Nagas — the sentence that Nagas, and especially the NSCN (IM), have always remembered. Neither Indira Gandhi nor Rajiv Gandhi ever visited Kohima as Prime Minister. A visit by Jawaharlal Nehru had witnessed an embarrassing spectacle of 5,000 Nagas turning their backs on the PM after he rejected the demand for a “sovereign” Nagaland on March 30, 1953. Morarji Desai and H D Deve Gowda travelled to Kohima, but neither of them is remembered with the fondness that the Nagas have for Vajpayee. The first NDA Prime Minister not only recognised the “unique history” of the Nagas, but also admitted that mistakes had been committed, and lamented the unnecessary spilling of blood in the state. “It is true that of all the states in India, Nagaland has a unique history. 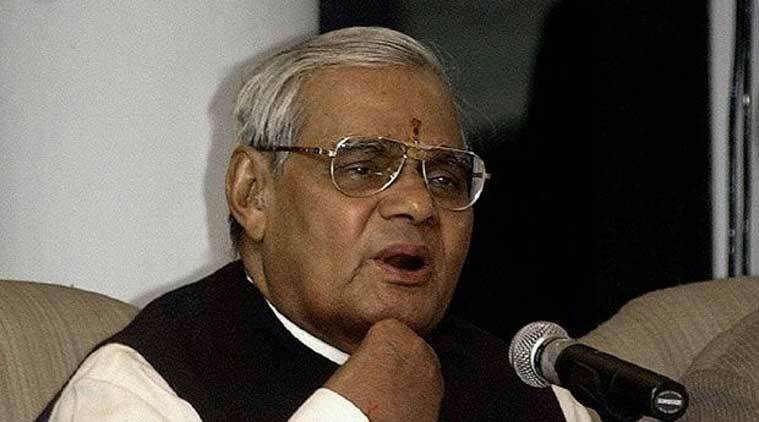 We are sensitive to this historical fact,” Vajpayee said in his speech. “But this uniqueness has in no way diminished the spirit of patriotism among the Naga people. We have the inspiring examples of patriot Jadunong, who became a martyr, and Rani Gaidinliu. Who can forget that in critical times of war in 1962, 1965 and 1971, Naga underground organisations did not fire on the Indian Army? They showed restraint. I would also like to acknowledge the sacrifices of jawans from Nagaland during the Kargil War,” he said. THE CATCH: “The Naga leaders expressed the view that other Nagas inhabiting contiguous areas should be enabled to join the new state. It was pointed out to them on behalf of the Government of India that Article 3 and 4 of the Constitution provided for increasing the area of any state, but it was not possible for the Government of India to make any commitment in this regard at this stage”. THE AGREEMENT: “The Government of India welcomes the steps intended to bring about peace in Nagaland and with this object in view… they will depute representatives, with whom will be associated the representatives of the Government of Nagaland, to take part in talks with leaders of the underground. To facilitate these talks and taking note of the letter of August 10, 1964… it has been ordered that with effect from September 6, 1964, and for a period thereafter of one month at present, the security forces will not undertake: a. jungle operations; b. raiding of camps of the underground; c. patrolling beyond one thousand yards of Security posts; d. searching of villages; e. aerial action; f. arrests; and g. imposition of labour by way of punishment.